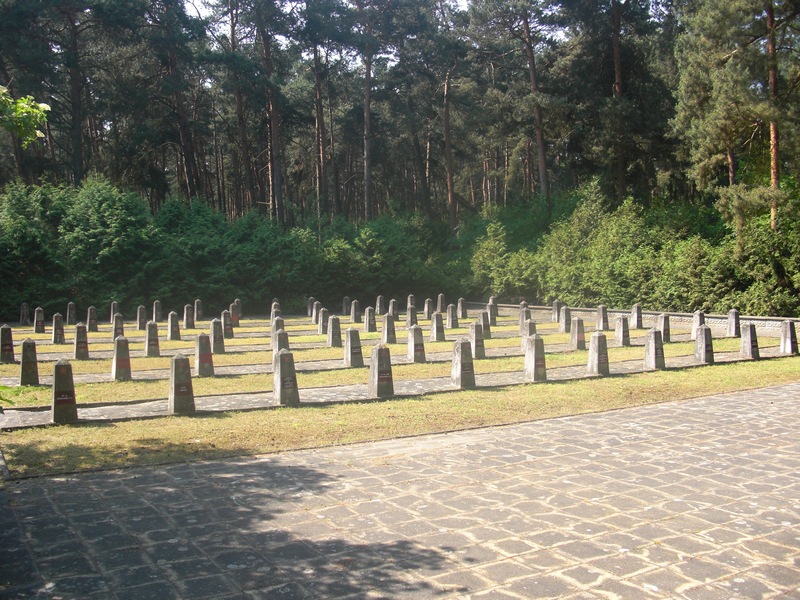 Not long after entering the Waldfriedhof, on your left. Context: A symposium held by the Historical Society of Southern California at the Autry Museum, Saturday 2 April 2010 on Los Angeles 1919 to 1945, addressed art, photography, music, literary culture, and architecture. One speaker was invited to address each arena. I contributed the presentation on architecture, and am posting it here. We’ve been asked to consider the span between the twentieth century’s two great wars. It was a vital crucible for architecture and urban design in Southern California: the emerging hegemony of the automobile; an explosion in urban growth; the masterful and innovative handling of historical idioms in the work of Roland Coate, Myron Hunt, Wallace Neff, and Paul Williams. Once the nation’s most popular house style, the bungalow with its friendly porches beckoning the street gave way to the ranch with pools and backyard barbecues. Part of that mix, of course, was the introduction of Modern architecture via the Midwesterner Frank Lloyd Wright and the Viennese, Rudolf M. Schindler and Richard J. Neutra, who arrived in the 1920s. The two reign as Southern California’s iconic alpha and omega geniuses who worked for Wright and then worked together before they each established dramatically different trajectories for California Modernism, forever changing its landscape and inspiring generations of successors. It may be a surprise to learn that Neutra’s first projects in Los Angeles of the mid- to late 1920s were not the skyscrapers he revered and worked on in Chicago. Neither were they experimental houses such as the Diatom series of prefabricated small dwellings, or the steel-framed Lovell Health House in Los Feliz, 1929, his calling card to international fame. Rather, his earliest projects were gardens, recalling the time after he completed his wartime service to Kaiser Wilhelm’s Imperial Army in 1918, when finding any architectural work was impossible during this economically exhausted period in Europe. Suffering from malaria and possible tuberculosis, a gaunt Neutra recuperated at a small rest home in Switzerland[3. A friend recommended him to a well-known Zurich landscaping firm and nursery owned by Otto Froebel (1878 – 1966), son of the equally renowned garden designer Theodor Froebel (1810 – 1893.) Thus, Neutra’s first postwar job was not indoors in a drafting room but outdoors. “There, through the summer of 1919, he worked under the tutelage of the noted Gustav Ammann (1885 – 1955) and developed an interest in botany, horticulture, landscaping and site design that would serve him the rest of his life.” Neutra planted, made topographical models, and was a general — if exceptionally talented — dogsbody to the Swiss Ammann, a peaceful Lutheran who took the ambitious Viennese Jew under his wing. They became life-long friends; Ammann even helped out with funds to aid Neutra’s trip to America. Later in Germany, in Dahlem, near Berlin, Neutra designed at least three gardens for the commissions of his close friend Ernst Freud, the architect son of Sigmund Freud, ct Ernst Freud, Sigmund Freud’s son and a close friend; architect Erich Mendelsohn, and famed architect Arthur Korn; when Neutra arrived in Los Angeles in 1925, Schindler gave him the landscaping and gardens to design for the Barnsdall House (Hollyhock), 1921 (Neutra completed the landscaping later), the Howe House, 1925, and the Lovell Beach House in Newport Beach, 1926. Neutra’s hardscape on the grounds of Barnsdall. Scan, Thomas S/ S. Hines, Richard Neutra and the Search for Modern Architecture. Neutra came to Los Angeles because of its unexcelled topographical beauty. As he told the Los Angeles Times in 1933, “the people here are essentially an outdoor people, subconsciously stimulated by an intimate proximity to nature’s charms … and they are not tradition bound.” But even earlier, by the late 1920s, he was also warning about the psychological, physical, and economic effects of a decentralized city. He argued that successful architecture also had to address the increasing hostile conditions of urban toxicities, advocating a Los Angeles that could be simultaneously denser and with greater recourse to nature, the city, after all, where he wrote “Nature Near,” “Mystery and Realities of the Site,” “Senses and the Setting,” “Plant Water Stone Light,” all of them enlarging the radius of the project of architecture into Nature. With that briefly outlined theoretical context, let us move on. 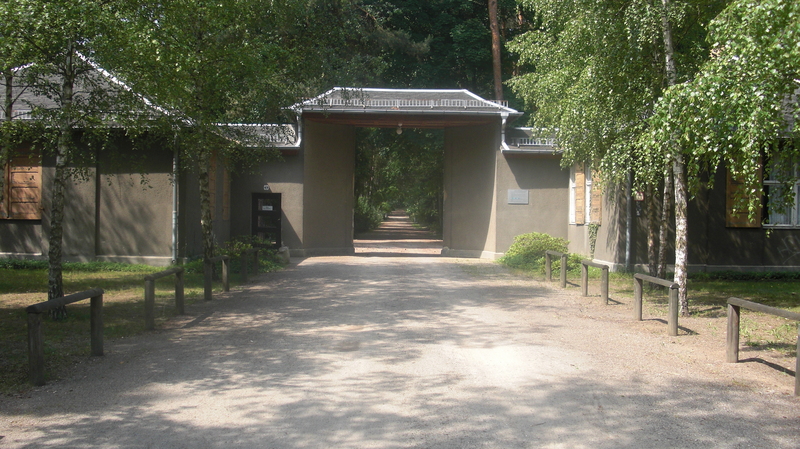 The project in question is Neutra’s only cemetery, located 30 kilometers southwest of Berlin, that he designed as part of a master plan during his brief tenure, approximately eight months, as City Architect for the proud 12th century feudal town of Luckenwalde, with 26,000 inhabitants. 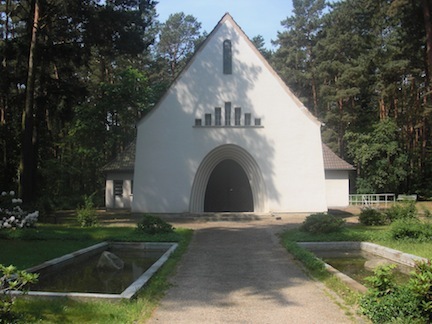 The 62-acre cemetery that Neutra called ‘his beautiful task” is called the Luckenwalde “Waldfriedhof,” literally a forested place of peace: wald, forest; fried, peace; hof, place. And when, as my title says it is forgotten, it should be the first project in the large canon of his work I wrote. You will not find it. 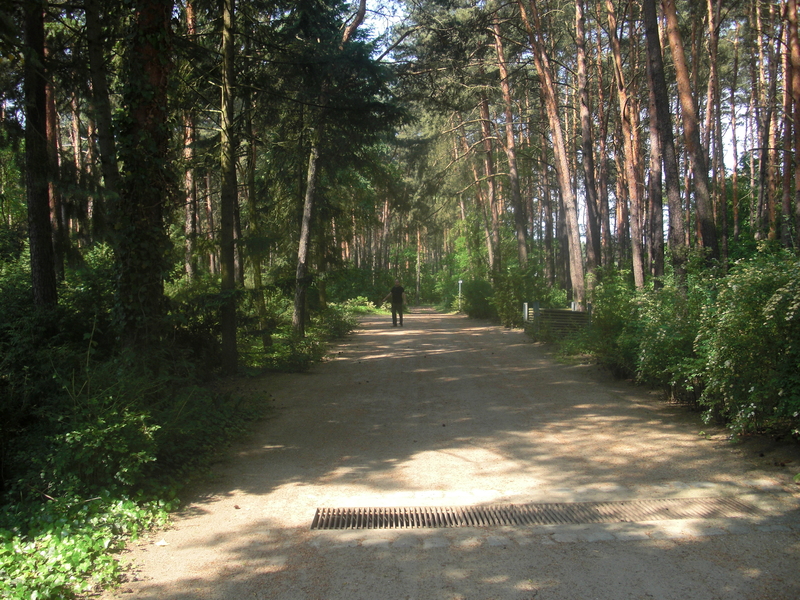 When I stood in Waldfriedhof last summer, all my senses breathing in the serenity of this place, my oversight shocked me. When I got home, I found plans and sketches in his archives, and lastly, an odd manuscript in dense German, its binding broken, about 6” x 14”, its edges black and charred, its condition betraying it as one of the few survivors of the fire that destroyed the Silverlake family home in 1963. This manuscript contains Neutra’s authoritative thesis, extensive research, a full documentation of every one of the 109 plants, trees, and flowers he used, and a meticulous budget that included future maintenance. Such careful documentation portended what he considered a major achievement, his orderly specifications for his buildings, in which nothing was left to chance. For me, even given my college German, Neutra’s personality explodes off the brittle pages, bearing down on all fronts whether poetical or pragmatic, persuasive, cajoling, using any and all means to further his objective. Here you can clearly hear his voice in the text, stoutly arguing not only for a wooded, landscaped setting but, as he wrote, for the “right of even a farmer to share the same privilege as the first President of the United States, George Washington, who was buried at Mount Vernon overlooking the Potomac River,” thus reinforcing the ideal of a pastoral yet democratic pastoral setting fit for both president and farmer. Earlier garden cemetery precedents had a very “democratic” role: they quickly became the first public parks, meant for hoi polloi and not reserved for the private estates owned by the aristocracy. These early cemeteries were part memorial, part family playgrounds and picnic venues, all part of a larger response to the hostile aspects of the Industrial Age, dank overcrowded Victorian cities, illnesses compounded by unsanitary cities, and war-torn Europe. Neutra himself had considerable personal knowledge of such illnesses: his grandparents died in the 1850s from a typhoid epidemic; his father Samuel died in 1922 from the Spanish influenza that swept Europe and American in 1919, his older brother Siegfried died in 1946 of tuberculosis here in Los Angeles. Nature wasn’t just landscape, it was sunlight and fresh air. The manuscript, however, betrays no trace of his exasperation with the city bureaucrats, a frustration that he shared in letters with his wife Dione, telling her that one councilman had said in a meeting that it was ludicrous for a city the size of Luckenwalde to have its own garden architect when Cologne didn’t even have one, that the cemetery was a donkey, that it was socialistic, too expensive – and the clergy, especially the catholic archbishop, were outraged and didn’t want competition for housing the dead.” To put that whirlwind of complaints into context, in Europe, graveyards were historically affiliated with churches and religions. If you were an Evangelical, you were laid to rest with Evangelicals; Catholic, with the Catholics. 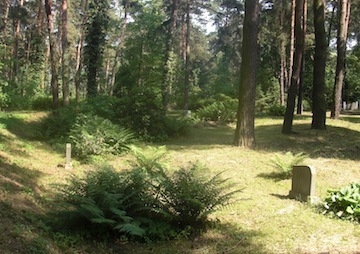 Luckenwalde Waldfriedhof, the city’s 3rd and much needed resting ground, the first after the Great War, and was expressly intended and championed by Neutra as something new, as a municipal, non-denominational cemetery, and not huddled around the skirts of a church but in a forest. It is also the only work by Neutra that I could call expressionistic, and not at all Modern except in certain respects. The plan’s principal element is the scarab beetle, the royal Egyptian symbol of the endless cycle of life and death, not exactly a Christian motif, driving home the point that the ritual of death applies to all societies across all time. The scarab was a familiar symbol in the Egyptian Revival, probably the most glamorous of the Victorian revival styles of the 1850s – 1890s, when Egyptian motifs and symbols were the rage after the Napoleonic campaigns at the end of the 18th century. The great archaeological digs culminated in opening King Tut’s tomb in 1922, just after Waldfriedhof’s architect completed his design and had left for glittering Berlin and work with the celebrated Modern expressionist, Erich Mendelsohn, and the cemetery was under construction; the discovery of the tomb precipitated a new wave of Egyptian Revival, happily employed in Art Deco and Hollywood Regency styles. Since Egyptian cosmologies were concerned with the divinities of nature, the scarab would perhaps be a logical inspiration. The beetle, for example, rolled a ball in front of it containing its eggs wrapped in dung, both dung and eggs the zenith of “natural.” But Neutra never before or ever again based a site plan on a symbol, let alone such a literal interpretation of one. For example, if you look at the zig-zag line, defining clearings, they are actually the scarab’s legs, while the two larger mirrored angled lines refer to the wings. And were you to see the original plan, you would be shocked at how literal the bug is. However, Neutra manipulated this symbol in several ways. First, note the overall distribution of landscape areas, each different, and each a distinct space. There are many places to be buried, the plan seems to say: death is decentralized into many zones, all lovely. Historically the scarab as a symbol was restricted for royalty, never for hoi polloi. Here everyone is royal, egal, no one grave more important than another, yet another homage to democratic ideals. While the entrance portal itself is bilaterally symmetrical, its location, at the corner of the cemetery, is not. This sets up the rest of the plan, asymmetrical, beginning with the long entrance path running along the edge of the property. Asymmetry was an expressly Modernist tenet of the International Style, and paralleled progressive garden designs abandoning the formal, more axially symmetrical plans of traditional cemeteries in favor of a more subtle balance. Neutra animated this large, potentially static area with turns, clearings, terraces, gentle, small hills, subtle shifts in elevation, changes from dark protection to bright meadows, curves offsetting straight lines and responding to the need for solemn, public processions; open areas for fallen soldiers; and quiet private moments with the dead. In every way, the scale is beautifully modulated, a quality that I both saw and felt. It is only through the black book, as I call it, that we understand Neutra’s method. Whereas I’ve always viewed him as the embodiment of the radical new theories of the 20th century, scientific as well as architectural, here he eagerly embraces 19th century precedents with no apologies. For example, he refers often to Spring Grove Cemetery in Ohio, designed by an “A. Strauch.” SLIDE SEVEN This is Adolf Strauch, 1822 to 1883, a Prussian landscape. Strauch had read the 23-volume book, Kosmos, written in 1849 by the globetrotter naturalist Alexander Humboldt. Humboldt described the strange natural beauty of Chinese grave gardens, which Strauch reinterpreted by ridding Spring Grove Cemetery of all the little railings marking off individual graves and extraneous detail in favor of a landscape that was complex but strong and cohesive. 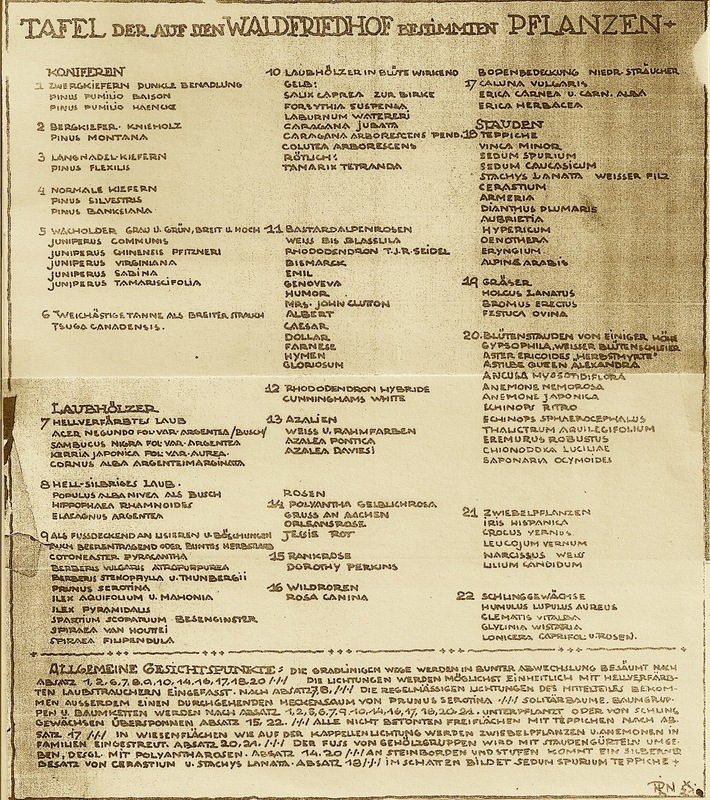 In this manuscript, Neutra carefully documents other garden cemeteries from New Orleans to Leipzig, noting their major attributes, all of which are Modern in reconceiving the cluttered graveyard as a garden cemetery whose ornament is nature. He talks about creating carpets, of bright lines of silver, of crocuses, copper beeches, irises, wild roses, groupings of conifers. So let us go in. One enters the city of the dead through the symmetrical gate with the hipped roof, quite Germanic and hardly Modern. The long procession begins with a straight path. or SLIDES TEN THROUGH THIRTEEN head to the nondenominational Chapel, unbuilt until 1937, not to his design, and I must say I’m relieved; Neutra’s proposal was a plain box with a long side-gable roof, curiously interrupted at the roof line with a series of projecting horizontal clerestories, a poorly resolved design that smacks of a determination to insert Modernism no matter what. SLIDE FOURTEEN Considering the landscape – as distinguished from nature, a much larger concern – became a lifetime practice either by himself or in collaboration with clients or landscape architects including Garrett Eckbo, Ralph Stevens, Roberto Burle Marx, Jocelyn Domela and Gertrude Aronstein. Here you see [not posted on this website] the Tafel, the table of plants Neutra specified, including over 109 plants, trees, ground cover and shrubs. He specified some of these plants, such as the hardy juniper, for the rest of his life. In an unsigned typed letter dated May 1970, right after Neutra’s death, the eulogizer wrote: “Here starts a new architecture that tried to understand the plant and the natural setting … man turned his back to nature and through the perfection of his technique, he moved away from it.” Neutra never did. 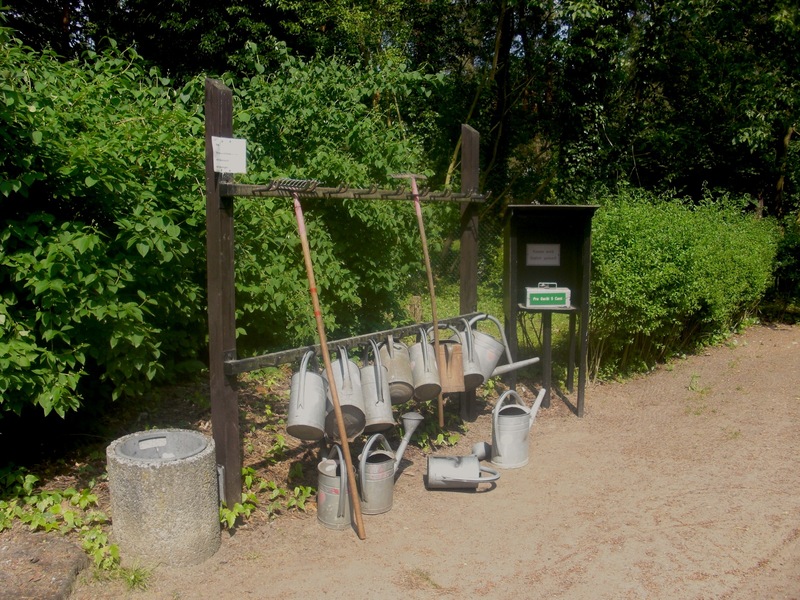 I’ll close my talk with this last image: Pails and rakes, for anyone’s use to care for the land and a loved one: communal tools for a democratic everyman. Formally titled the Serviceman’s Readjustment Act, the bill was signed by Franklin D. Roosevelt on June 22, 1944. Unpublished letter to Richard’s future mother-in-law, Mrs Alfred Niedermann, Lilly, from Berlin, November 1920 (no day date). Part of a photocopied manuscript given to the author by Mrs. Richard Neutra. This was the home of Elsa Telekey. See Thomas S. Hines, “Richard Neutra and the Search for Modern Architecture,” p. 26. 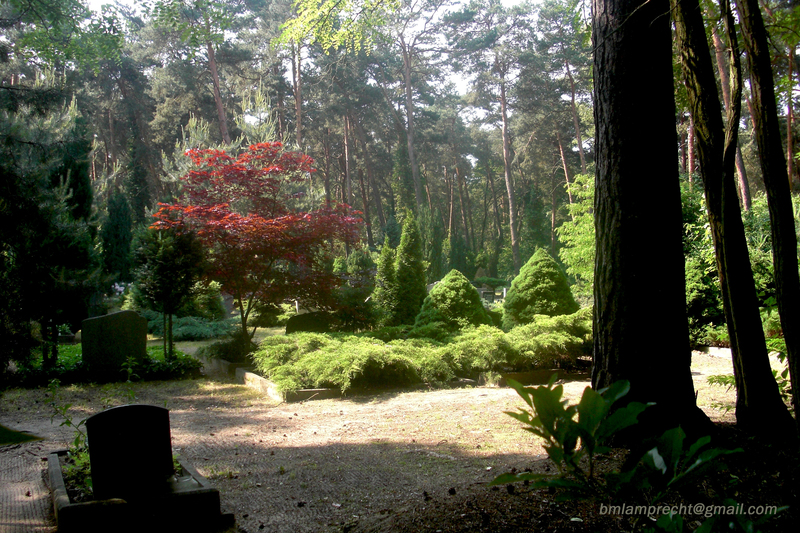 Landscape gardener and theorist Werner Heggeman’s influential “Das Parkbuch,” addressing park reform, was published in 1911 by Ernst Wasmuth Verlag, established 1872, (the same publisher for Frank Lloyd Wright’s Portfolios, issued the previous year). 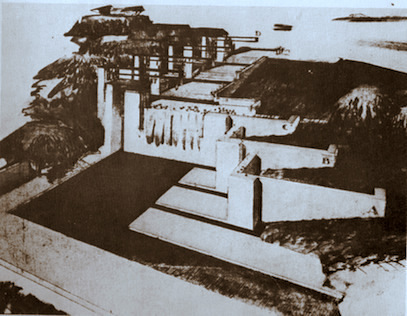 Leberecht Migge replanned Frankfurt for architect Ernst May in 1928. 106 – 107, below. “Small folds in the land, lower-water areas, the form and situation of gravel pits, etc., give suggestions for further development, for small terraces, canals, little valleys, and embankments. 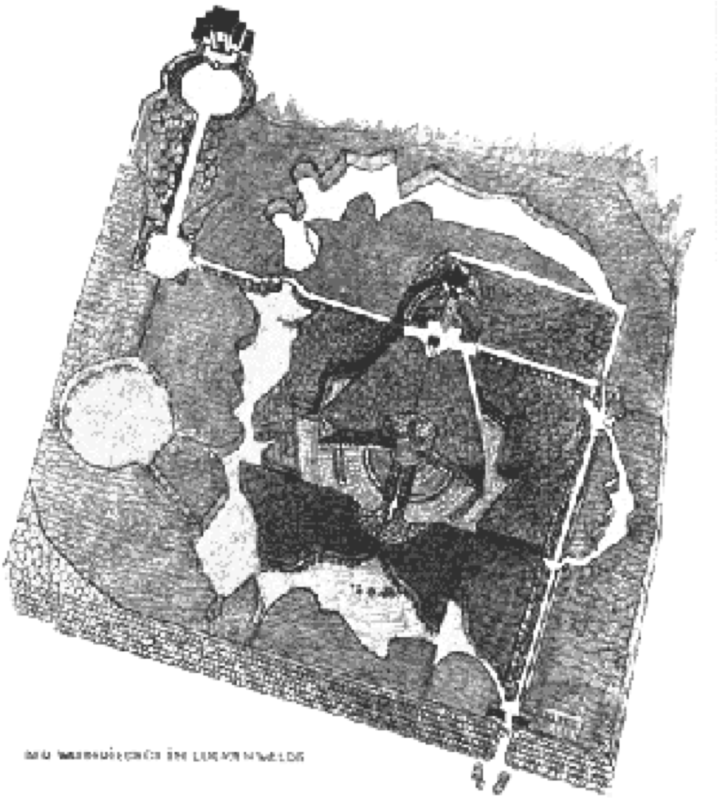 A study of the plan shown here shows the caring attention to all of these small, incidental implications.” See Footnote 43, Gustav Amman, “Neuerungen bei öffentlichen Parkanlagen,” Die Gartenkunst 12 (1914): 187 in David H. Haney, Bringing The Americanized Pückler Back to Germany: Charles Eliot and the German Park Reform Movement, GHI Bulletin Supplement 4 (2007), 89 – 110. 102. Philip Johnson and Henry Russell-Hitchcock The International Style: Architecture Since 1922, p. 71 – 73. My password has stopped working. A fascinating window into the formative period of RJN. It’s always interesting to study the process and evolution that informs the creative process. With all the “glossy-mag” celebration of modernist style that proliferates these days with “Neutra”, it’s refreshing and rewarding to learn how and why his designs remain so compelling. Nice work Ms. Lamprecht.